After all of the delicious food and excitement over the holidays I wanted an easy meal I could throw together. When I think quick and easy I always think of seafood. Seafood is usually quick cooking and you can have dinner on the table in no time. It had been awhile since I have had so I decide to take a classic dish like chicken picatta and recreate it with salmon. 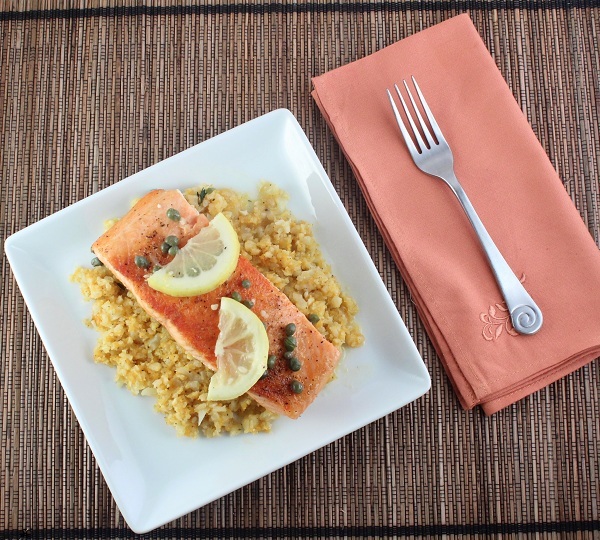 The lemon and caper pair perfectly with the salmon. It’s light and fresh and perfect for a weeknight meal. 3 Tbsp capersHeat 1-2 Tbsp of oil in a large skillet over medium-high heat. Season the salmon with salt, pepper, and garlic powder to taste. Sear the salmon for 3-4 minutes per side. Remove from the pan and keep warm. Add the stock (scrapping the browned bits off the bottom of the pan), lemon juice, and the garlic to the skillet. Reduce heat to medium and cook for 5-7 minutes or until the sauce has reduced. Add the capers and lemon slices. Cook for 1-2 minutes. Serve the sauce over the salmon.